Proboscis monkeys are so called because the males have long, flat, wide noses. 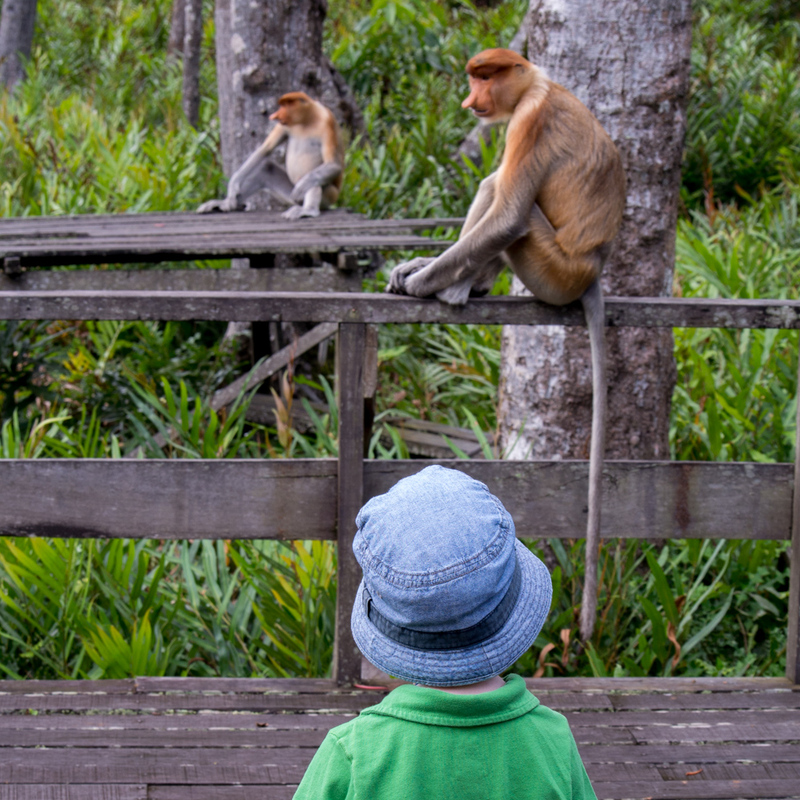 We went to the Labuk Proboscis Monkey Sanctuary to spend some time with them and watch them swing grandly among the trees. Three families came to the feeding platforms, first the large males, running and slapping their feet on the wooden boardwalk to assert their dominance over their territory, followed by the females and babies. Each family sat at a separate platform, delicately eating cucumbers and squares of sugarless pancakes with their long, slender fingers. A few tussles broke out, mostly, it seemed, over pancake, but they were short lived. We were able to get within two or three feet of them, but were warned not to touch them because they can be aggressive if they feel threatened. They only seemed languorous to me, lazily swinging their long furry tails and looking at us with brief curiosity before focusing their attention on breakfast, the trees, or the water below us among the roots of the mangroves. We watched them for an hour, following them from perch to perch, waiting for their next move. Eventually, they realised breakfast was over and so they made their way off, one by one, into the dense trees and leaves. We’re back at the resort now, playing a game of dinosaur puzzle with Rowan while it rains what sounds like a torrent outside. The roof of the resort is metal, so even a small shower might seem like an earth shattering storm.